It Morphed! – A Guest Post by Valerie S.
In 1969, instead of producing its familiar gourds, a pumpkin patch in town yielded a K-Mart store. A December or two later I was invited to go there with a friend and her family. With $32 of hard-earned babysitting money in my pocket, and a painful shin bruise courtesy of one of the brats I sat for, I was excited to go on my first ever Christmas shopping trip. I can still remember standing at the register holding my breath and shaking as the items rang up. What gift would I put back if it rang over? Which of my twelve intended recipients would I disappoint? Fortunately my math was fine and I had remembered to include an amount for that mysterious thing called sales tax. The clerk had no idea the $31 and change I placed into her hand was the most money I had ever spent. It was a dizzying experience that left me feeling faint. That night, instead of sugar plums, I dreamt of the day I would be a lady who regularly shopped at K-Mart and spent $32 without batting an eye. A few years later I became that lady. But instead of shopping at K-Mart, a good paying part-time job and access to the family car allowed me to shop at the largest regional mall in the country. As nice as K-Mart was, Randhurst was truly heaven on earth. Three department store anchors and dozens of specialty shops made Christmas shopping pure joy. I would often run into friends and family there and we’d show each other the treasures we’d found as we dined at one of the mall’s many food venues. While K-Mart remained my go-to place for items like gift wrap and tape, Randhurst was where I did my serious Christmas shopping. The only thing I can say for sure about catching Christopher’s eye is the outfit I wore was purchased at Randhurst. A full-time job and my own car allowed me to shop there for most everything. My dream of shopping at K-Mart had long since been forgotten and another dream was coming true. Chris and I married and bought a house in the town I had lived in all my life. Simply by saying “I do” we became “dinks” (dual income no kids) and, quite unconsciously, did what dinks did – shopped at the nearby “super regional mall,” Woodfield. While we never, ever, stepped foot in K-Mart and rarely went to Randhurst, we did patronize local businesses and stores as much as possible. One day an acquaintance asked if I had ever been back to my high school. I laughed and said “Back to it? I pass by that prison every day!” She commented how nice it must be to live in the town you grew up in. I agreed it was. When main thoroughfares flooded I knew alternate routes. I knew the good restaurants and, more importantly, the bad ones. I knew a great many people. No, I never envisioned the downside that was to come. One of the things that hit me hardest after Chris died was there was no place in town that didn’t hold memories of our life together. Just driving past stores, restaurants, or the park would send me into hysterics. Slowly I learned to hold it together in places like the grocery store, the bank, and the post office. It has taken every minute of the last three and a half years to get to the point where I finally feel like “myself” again. Now when I go to the auto parts store I am the teenage girl who used to go there, not Chris’s widow. 2014 was my fourth Christmas without Chris and the first that I was both financially and emotionally able to go “full tilt” Christmas shopping. My inner teenage girl begged to go to Randhurst. I knew better, but went anyway. What was once heaven on earth is now, no thanks in great part to Woodfield, a mall dying a slow death. I purchased a couple items at the big box store and left. On the way home, calling heavily upon my marketing degree, I struggled to explain retail dynamics to the teenage girl. We both wept. Was there any place left that could bring the dreams of the young girl in line with the woman who lived those dreams? How about K-Mart? There are no Chris memories at K-Mart. You can relive that first shopping trip. Yes, K-Mart! Try K-Mart! Surely the last payday before Christmas would bring a huge crowd and much holiday cheer. I might have to park pretty far from the door. But that’s okay. No kid has kicked me in the shin so my leg doesn’t hurt and I can walk! I was not alone when I went to K-Mart that Friday night. It was with me. It guided me to the parking space closest to the door. It counted twelve other cars in the lot. It made me look up and watch as a blaring ambulance passed by our Chinese restaurant, our bank, our strip mall, our other bank, our Wendy’s, our tire shop, our post office, our McDonald’s. It laughed. I cried. I went back home. It had morphed! No longer the constant companion, grief was now an opportunistic stalker lying in wait. Well, Grief, you won that round. Good one. Kudos to you. But if you can morph, so can I. And I already have. This middle-aged widow called upon her K-Mart/Randhurst training and, cheered on by that inner teenage girl, turned into Super Shopper who effortlessly zigged and zagged her way through the crowds at Woodfield and finished shopping in mere hours. So there! Your efforts to sabotage my shopping ultimately failed! Loser! And I have no problem revealing my secret weapon to you, Grief, because you are powerless against it. Go ahead and try to get me again. I am Super Aunt and one hug from any one of my six nieces and nephews will squeeze you right out of me. And mind you, the two-year old squeezes the hardest and she will hunt you down if you ever make her Auntie Val sad. So, bring it on, Grief. 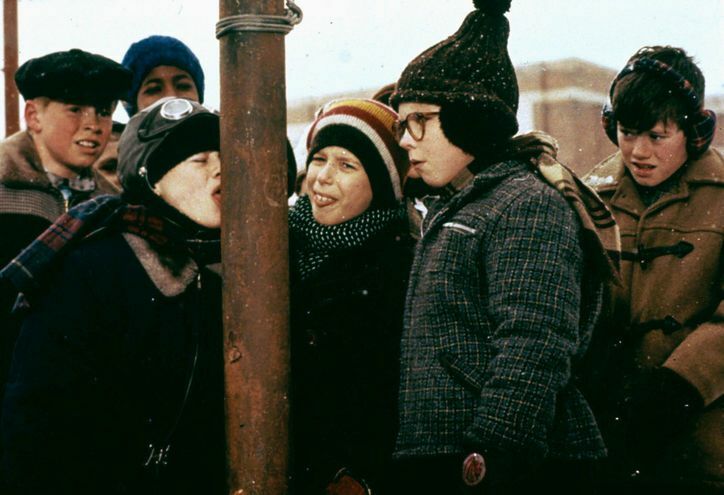 I triple dog dare ya! tagged with A Christmas Story, Valerie S.
What a wonderful, triumphant story! I think, Valarie, that you should write a book. The world needs your voice, the voice of the Victorious Aunt Val. More than that, really, as we have twenty-six dogs (we run a sanctuary).